I wish I had taken a picture of the orange moon. Ten shivering Coltishall Jaguars stood in Whitlingham car park at 7:45pm on a rapidly darkening late summer evening. I had just cycled from Langley to Whitlingham, it hadn’t felt far, but standing waiting for the start, I felt like I was going on a polar expedition. I had spent the best part of an hour putting on various vest and top combinations, like goldilocks. When my lovely team mates pitched up, it became clear, no one knew what to wear. Except perhaps Thomas, he was lit up like a very nice Christmas tree. We spent most of our time shivering and comparing lighting equipment, I forget who had the airplane landing lights, but they were cool. Having previously run a stretch of the route, Nicola and James provided some insight into what lay ahead. I heard the words field, mud and water, if only that had been all. I am pretty sure the route was on the Wherryman’s way, which runs alongside the river Yare (please don’t write your travel book based on this information, I’m not totally sure where we went). After more shivering, and way too soon, it was five minutes to go. I feel like I’m about to do this write up an injustice because, in the pitch black, it was hard enough to see five metres in front of me let alone know what other people were doing. I know I missed most of the Jaguars who were helping at various water stations, thanks though! It was so dark, for the first five miles I was looking at James’ back, it was not until he held a kissing gate for me (gent) that I realised it was him. I repaid the favour when he went the wrong way, twice. Most of the first part of the run was a battle of ‘am I running the right pace’ I think this might have been a universal problem because of the dark and the surface under our feet was always iffy. I think the man I saw fall into a bush would agree. But from speaking to people at the end of the race, I believe we all agreed running at night added something special, the cheers from all the people sitting outside pubs, the total silence running along the river, the sense of being in it together felt somehow bigger. The route was about thirty percent road, the rest of the route was along single track grass sections, off camber decking, many kissing gates and what we all now affectionately refer to as ‘nettle mile’. I enjoyed nettle mile, weird, the illuminous medal was nice but nettle mile really was something else, medicinal and stimulating. I’m sure other entrants could add limitless other heroic stories, the event was just an exceptional experience and although it was right on our doorstep, the sense of adventure was tangible. 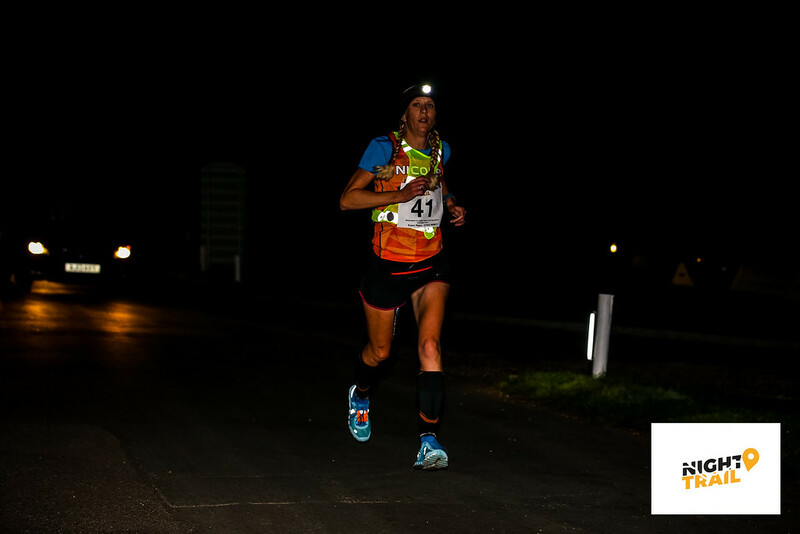 We had some great results too, Nicola Lambert was 2nd lady and 12th overall, James Lambert was 2nd overall and I was a bit shocked with 3rd overall and obviously a half marathon PB as it was my first. Thomas Lincoln-Kemp was 1st in age category and 8th overall. Paul Rogers had a great run and came in under two hours for 33rd. 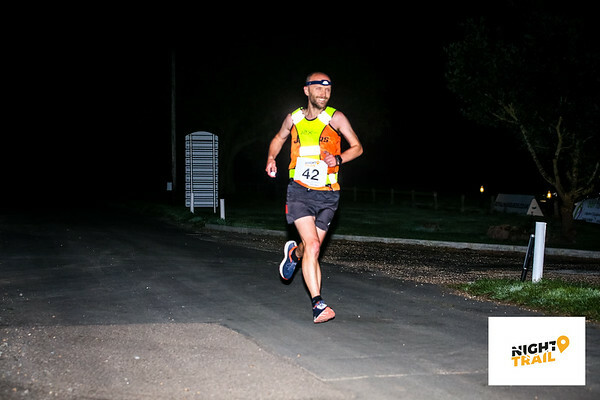 Clive Cartner and Angela Gallen-Bell ran together (through nettle mile) for 89th and 90th and Claire hicks, Owen Barber and Paul Gerber made a great team coming in 107th, 108th and 110th respectively. Post-race I began frantically Googling night time 12 hour races for the Jags to take a team too, the results are nice, but more than that and the reason why I joined a running club, I felt part of something, that is what running really does for me. Oh and I really wish I had taken a photo of that orange moon.